World Malaria Day - Malaria Costs Nigeria Billions of Naira Each Year. What Does It Cost a Nigerian? 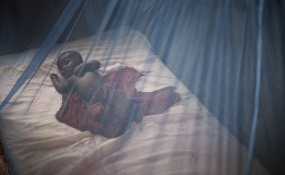 A child lies under a mosquito net in Somalia. Imagine that snake attacks were killing a person a minute. Or that it was dogs, or foxes or chickens that were killing three-quarters of a million people a year. Envision the non-stop media coverage - and the public outcry to stop the deaths. Instead, the mass killer is the mosquito, weighing in at 2.4 milligrams, about the same as two human eyelashes. Scientists say the mosquito is the most dangerous creature on earth, carrying diseases that have killed more people than all the world's wars combined. Across much of the world, the insect is treated as no more than a nuisance during outdoor activities; mosquitoes in temperate climates rarely carry the parasite that causes malaria. But malaria-transmitting mosquitoes blanket more than 40 percent of the earth, and 90 percent of the deaths they cause are in Africa. Today, on World Malaria Day, as on any given day, an estimated 3,000 children will die of malaria -- most of them before their fifth birthday, according to the United Nations. More than one-quarter of all childhood deaths in Africa are attributed to malaria. But unlike an animal attack, the deaths are rarely dramatic -- a fever, lethargy, crying. The predominant way that children die of malaria is through repeated infection with the Plasmodium falciparum parasite carried by the Anopheles mosquitoes, which are predominant in Africa. When children are bitten over and over again they continually have the parasite in their blood. Even when an acute malaria attack doesn't kill, the cumulative effect can be severe anemia, malnutrition and other complications. "It just sets them up for death, and that death is not a dramatic illness," said Carlos "Kent" Campbell, director of the malaria control program at PATH. "It is a slow, insidious death." In fact, pneumonia or diarrhea may deliver the final blow because the child's weakened system is incapable of fighting off the infections. Malaria can wear children down for a number of reasons. In remote areas, clinics or pharmacies may not be within reach. Even in those facilities, medicines may be out of stock - a "stock-out" in global health parlance. Or a family might be too poor to purchase the first-line artemisinin-combination therapy (ACT) that is most effective. Or they might purchase what they believe to be ACTs, only to discover too late that the drug was fake. The picture for these children is bleak - but it does not have to remain that way, malaria experts say. In recent years, remarkable progress has been made in the fight against the disease, and if similar progress continues, they say the world may one day see malaria's eradication. A set of interventions - the use of "residual indoor spraying" of interior walls with a low-toxicity insecticide, the distribution of bed nets, the use of rapid diagnostic tests and improved treatment with ACTs - have led to a one-third reduction in malaria deaths in the past decade alone, according to the United Nations. Overall child mortality rates have fallen by about 20 percent in countries where access to malaria control interventions has improved most significantly. That strategy, Scaling Up for Impact (SUFI), has been implemented to scale in 20 of 47 countries in Africa where there is malaria, Campbell said. "In the past five or six years we've proven that once those interventions are deployed in a range of 60 percent of population coverage there's a precipitous fall in terms of malaria transmission and malaria mortality, particularly among children, who suffer the greatest brunt," he said. The World Health Organisation (WHO) in December said in its World Malaria Report 2012 that a "concerted effort by endemic countries, donors and global malaria partners" had led to strengthened malaria control around the world. The scale-up of malaria prevention and control interventions had the greatest impact in countries with high malaria transmission; 58 percent of the 1.1 million lives saved during this period were in the 10 highest burden countries, the report said. "Ten years ago, bed nets were not being used at a wide scale. Indoor residual sprays were not being used at a wide scale," said Alan McGill, who oversees malaria strategy for the Bill and Melinda Gates Foundation. "We were in a transition period between drugs like chloroqine and Fansidar that had lost their efficacy because of resistance and before the scale-up of artemisinin combination treatments." "If you take that as a baseline, over the last 10 years, when those interventions were rolled out at a much wider scale, you have to credit them with being incredibly effective, as well as multilateral initiatives," he said. "We certainly have seen tremendous strides forward." Maintaining proven interventions is key, malaria experts say, and continued financial support is crucial. The United Nation survey reports an annual shortfall of U.S.$3.6 billion in funding the malaria battle. That concern is reflected in this year's Roll Back Malaria theme -- "Invest in the Future: Defeat Malaria". Administration and managerial problems at the Global Fund to Fight Aids, Tuberculosis and Malaria complicated implementation of anti-malaria strategies, but Campbell said that improvements at the Fund offer hope for growing, consistent support for anti-malaria programs. For that to happen, however, depends on steady financial support from the Fund's global donors. Campbell and others say another big challenge is to sustain the achievements already made: bed nets have to be replenished every three years and treatment drugs have to be available, along with rapid diagnostic testing. The testing is important. Malaria across Africa is now resistant to the former most-common treatment, chloroquine, still widely sold in many countries despite its ineffectiveness. As ACTs become more available, treating every fever as though it were malaria will speed the resistance to those drugs as well - and there are no more drugs in the pipeline. Already, alarmingly, resistance to ACTs has been found in the Mekong region of Asia. "The rapid success in bringing down malaria deaths does not in any way mean that the malaria problem is fixed or there is no malaria problem or investment in malaria control doesn't need to continue," Campbell said. "It is in many respects like immunization programs. You have to continue to immunize and cover the population. Right now that recurrent cost has to be borne, and there have to be programs in place to address clinical illness, even though it may be at a much lower level." Despite progress otherwise in the malaria fight, it is a race against time. A potential slip in funding could be catastrophic, according to scientists. And in addition to the potential of spreading resistance to ACTs, there is the threat of resistance to pyrethroids, which is the insecticide with which many bed nets are impregnated. ?McGill said the current transmission interruption measures -- bed nets, residual indoor spraying and increased testing and treatment with ACTs -- have to be maintained at a certain scale of coverage in order to maintain the benefits. "Historically, going back a hundred years when those control measures are removed, for whatever reason, resurgence is typical," he said. "There would be significant concern about a resurgence in countries that scale back. And one of the goals long term is not only to scale up for impact but to scale up for elimination. That's the only long-term way to deal with this problem."